Rosahl is a unique dehumidifier that works using a solid state polymer electrolyte (SPE). It removes moisture from the air in enclosures by electrolysis when a small voltage is applied. It provides clean moisture extraction and low cost, maintenance free performance. The process involves venting the unwanted moisture to the outside, and a cut-out must be made in the side of the enclosure to enable this to happen. 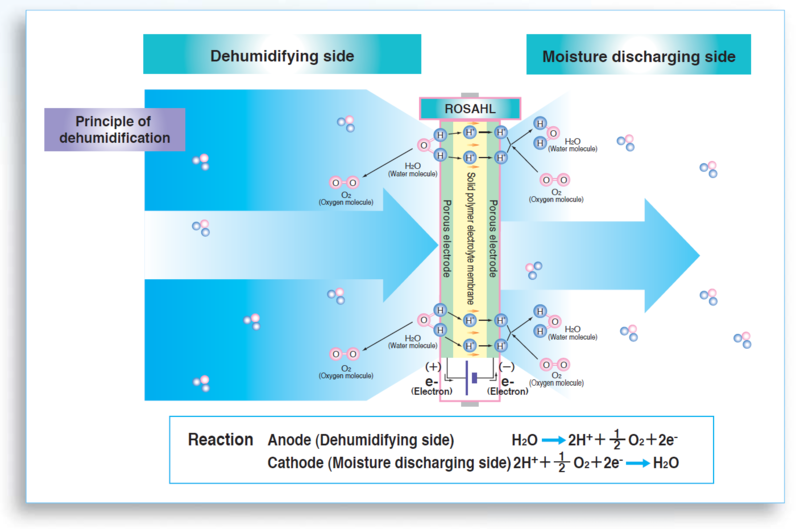 Sometimes called an ionic membrane dehumidifier, Rosahl works by electrolysis. The SPE consists of a proton-conductive solid polymer electrolyte and porous electrodes with a catalytic layer composed of noble metal particles. When a 3 Volt D.C. charge is applied to the SPE’s porous electrode, the moisture on the anode (dehumidifying) side dissociates into hydrogen ions (H+) and oxygen. The hydrogen ions (not hydrogen gas) migrate through the membrane to be discharged on the cathode (moisture discharging) side where they react with oxygen in the air, to form water vapour. The SPE can also be used as a humidifier by reversing its direction flow.